Home Entertainment Featured Celebrity News Updates about Gretchen-Claudine Barretto issues Why Gretchen Barretto Helped Claudine's Ex-assistant named Dessa Patilan? Why Gretchen Barretto Helped Claudine's Ex-assistant named Dessa Patilan? All are asking, why Gretchen Barretto helped Dessa Patilan that were charged by her sister Claudine Barretto for qualified theft and been jailed for 10 month already? Gretchen said that she feels its was her obligation to help the ex-assistant of her younger sister Claudine according to ABS-CBN news reporter interviews, Satuday, March 20, 2014. Dessa Patilan was released from jail last March 17, 2014 after Gretchen posted the P60,000 bail and soon emotionally thanked Barretto publicly by means of media. On the other hand, Gretchen said on the interview that she actually does not like publicizing what she did in helping Patilan and no plan of publicizing further the assistance she may give to Dessa and asked the news media to stop the issue. Do you think this is connected with the sister's rivalry? Speak up you mind by posting comment below, thanks. 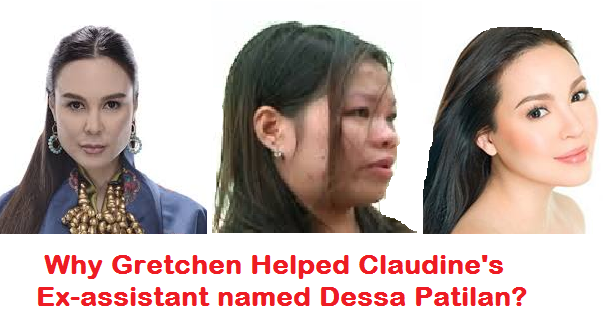 Further news related to this Gretchen-Claudine-Patilan issues will be posted on our future blog post.